Cake 13.5 ounces all-purpose flour (about 3 cups) 1 teaspoon baking powder 1/2 teaspoon baking soda 1/2 teaspoon salt 2 cups sugar 3/4 cup unsalted butter, softened 1 teaspoon vanilla extract 3 large eggs 1 1/3 cups low-fat buttermilk Cooking spray Glaze 2 cups sifted confectioners sugar 3 tablespoons lemon juice... or 4... or 5.... Preheat oven to 350°. Grease/spray two (8 x 4–inch) loaf pans or one big budnt pan. In a bowl, combine flour, baking soda, baking bower, and salt. Place sugar, butter, and vanilla in a large bowl; beat with a mixer at medium speed until light and fluffy. Add eggs, 1 at a time, beating well after each addition. Add flour mixture and buttermilk to sugar mixture, beginning and ending with flour mixture. Spoon batter into loaf pans coated with cooking spray. Bake at 350° for 60 minutes or until a wooden pick inserted in the center comes out clean. Cool in pans 10 minutes on a wire rack. Remove from pans. Cool completely on a wire rack. For the glaze... sift the confectioners sugar and whisk in the lemon juice until there are no lumps. The rest is up to you! 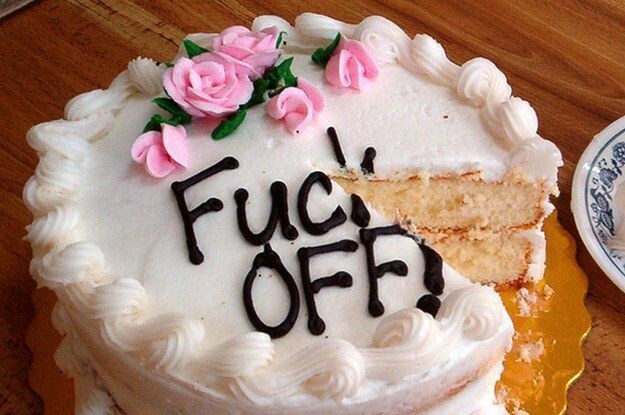 Do you want it thinner but don't want super lemon glaze? Add a few drops of water. 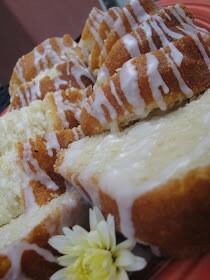 Or you can be like me... and wants super lemon glaze! : ) Drizzle away. I will try to make it this week. 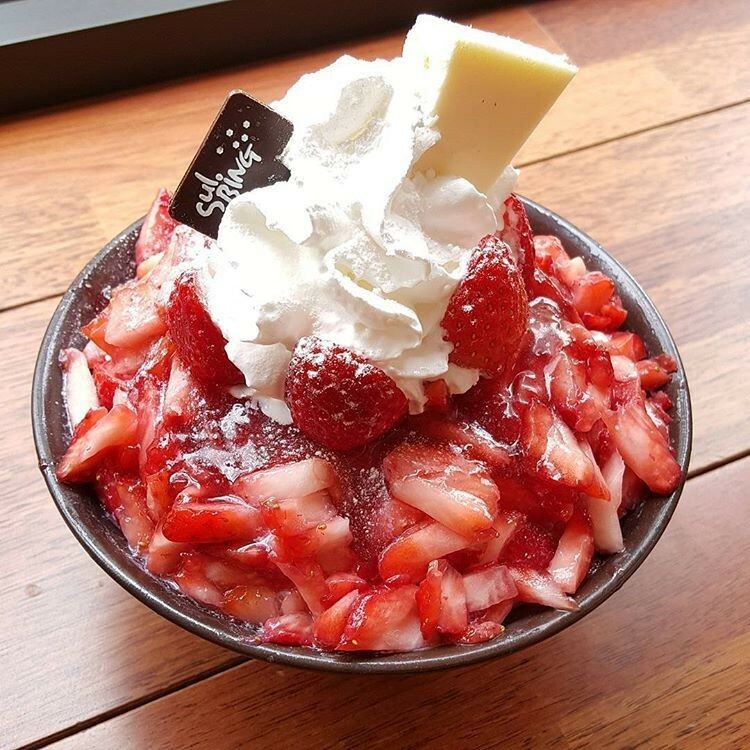 Strawberries will go well with it. @cupcakelady let me know how it turns out! This sounds so light and simple! It would go really well with some fresh strawberries on the side! Yield: 9 inch cheesecake Ingredients Crust 1 1/4 cup graham cracker crumbs 5 tbsp butter, melted 5 tbsp sugar Cheesecake filling 24 ounces packages of cream cheese, softened (three 8 ounce packages) 1 cup sugar 2 tbsp flour 3/4 cup cocoa (I use Hershey's Special Dark Cocoa) 4 eggs, room temperature 1 cup sour cream 1/2 tsp vanilla extract 1 1/2 cups mini marshmallows 1/2 cup hot fudge topping, warm, plus more for topping (I used most of this 12.8 oz jar) 45-50 large marshmallows (for topping) Instructions Crust 1. Heat oven to 325 degrees. 2. In a small bowl, combine crust ingredients and mix well. 3. Press mixture into the bottom and up the sides of a 9-inch springform pan with parchment paper in the bottom. 4. Bake crust for 10 minutes then remove. 5. Cover the outsides of the pan with aluminum foil so that water from the water bath cannot get in, and set aside. Cheesecake filling 1. Reduce oven to 300 degrees. 2. In a large bowl, blend the cream cheese, sugar, flour and cocoa with an electric mixer until combined (Use low speed to keep less air from getting into the batter, which can cause cracks). Scrape down the sides of the bowl. 3. Add eggs one at a time, beating slowly and scraping the sides of the bowl after each addition. 4. Add the sour cream and vanilla extract. Beat on low speed until well combined. 5. Add marshmallows in an even layer in the bottom of the pan, on top of crust. 6. Pour hot fudge topping over marshmallows. 7. Pour the cheesecake filling into the pan. 8. Place springform pan inside another pan. Fill outside pan with enough warm water to go about halfway up the sides of the springform pan. The water should not go above the top edge of the aluminum foil on the springform pan. 9. Bake for 1 hour and 35 minutes. Marshmallows may boil up through the top. 10. Turn off heat and leave cheesecake in oven with door closed for 20 minutes. 11. Crack oven door and leave the cheesecake in the oven for another 20 minutes or until set. 12. Remove from oven and chill. 13. Once completely chilled, preheat oven to 350 degrees on convection bake. 14. Remove springform pan sides from cheesecake and place cheesecake on a cookie sheet. 15. Top cheesecake with a layer of marshmallows. 16. Bake for about 10-12 minutes, or until marshmallows begin to brown. 17. Remove cheesecake from oven and drizzle with more hot fudge and graham cracker crumbs. 18. Cheesecake can be served warm out of the oven (which I recommend), or refrigerated and served cold. Caramel Sauce: 1 1/2 cups granulated sugar 1 3/4 teaspoons lemon juice 1 pint heavy cream 4 tablespoons unsalted butter Before I get into making the sauce, let me note that this isn't the easiest way for most home cooks to go about making caramel sauce. Melting almost pure sugar in a pan is pesky and it can burn quite easily. 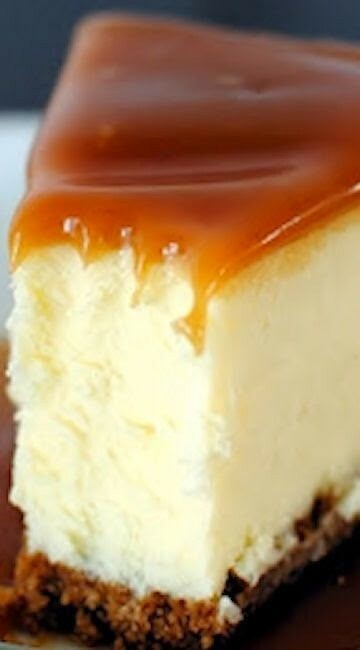 If you're not feeling up to attempting this part of the recipe, feel free to buy your favorite caramel sauce and warm it gently to glaze the cheesecake. In a medium sauce pan over medium high heat (I'm using non-stick for this), combine the sugar and lemon juice. Stir with a wooden spoon until the sugar is mostly melted then set aside the spoon and swirl the pan over the heat to keep the color even throughout. Continue to cook and swirl until it sugar turns a medium amber color. Watch it carefully, the sugar will quickly darken and should it become dark brown or black it will taste bitter and unpleasant. When the sauce turns the right color slowly whisk in the cream. If the caramel hardens with the addition of the cream, do not worry. Just continue to add the cream and bring the mixture back to a a boil over medium heat. Continue to stir until the sugar has remelted. Allow to boil for 5 minutes then remove from heat and stir in the butter. Pour into a heat safe container and chill until ready to use. Crust: 10 ounces graham crackers, crushed into crumbs 7 tablespoons unsalted butter Cheesecake Filling: 3 8-ounce packages of cream cheese, room temperature 1 1/4 cups granulated sugar 1/2 cup heavy cream 8 ounces good quality white chocolate, chopped 5 large eggs 1 teaspoon vanilla extract pinch salt boiling water Pre-heat the oven to 375°F. Combine the graham cracker crumbs with the melted butter and press into the bottom and 1 1/2 inches up the side of a 10 inch spring form pan. Bake for 10 minutes and then allow to cool completely on a wire rack. Reduce the heat to 325°F and prepare the cheesecake batter. Place the chopped white chocolate into a heat safe bowl and set aside. Bring the 1/2 cup of cream to a simmer over medium heat in a small sauce pan. Pour the hot cream over the white chocolate, jiggle the bowl to submerge it and allow to stand for one minute. Stir the chocolate gently until melted completely. In your mixer with the paddle attachment, beat the cream cheese until smooth and lump free. Add the sugar and mix, scraping down the sides of the bowl as needed. On medium speed, slowly add the white chocolate ganache. Once combined you can add the eggs, one at a time, beating on low speed until each egg is incorporated. Once you've added all the eggs, mix in the vanilla and salt and pour into your prepared pan. Set the pan onto a couple large sheets of aluminum foil and smooth them up the sides of the pan to waterproof. Set the cheesecake into a large roasting pan and then place in the oven. Pour the boiling water into the roasting pan, filling to about one inch (no higher than the lowest edge of aluminum foil). Allow to make at 325°F for one hour then reduce heat and bake at 300°F for an additional 60-90 minutes until the center is just set. Remove from the oven and allow to cool completely on a wire rack. Once cool chill for at least 4 hours before serving. To glaze, gently warm the 1 cup of the caramel sauce on the stove or in the microwave until slightly runny and then pour onto the cheesecake. Smooth the caramel over the cake and you're ready to serve. Enjoy. Ingredients For the Cake 2½ cups (280 grams) sifted White Lily® Self-Rising Flour 2 cups (400 grams) granulated sugar ½ cup (1 stick/113 grams) unsalted butter, at room temperature ¼ cup (48 grams) organic palm shortening ¼ cup (56 grams) organic almond oil, or favorite vegetable oil 1 cup (240 ml) organic buttermilk, at room temperature ¾ cup (180 grams) egg whites (about 6), at room temperature 2 teaspoons (10 ml) pure almond extract 1 teaspoon (5 ml) pure vanilla extract All-purpose flour and shortening or vegetable oil to prepare cake pans For the Frosting 2 cups (4 sticks/452 grams) unsalted butter, softened ½ 8-ounce container (113 grams) chilled fine-quality mascarpone cheese 6 tablespoons (113 grams) Strawberry-Raspberry Sauce (recipe below) 2 teaspoons (10 ml) pure vanilla extract 4 to 4½ cups (480 to 540 grams) confectioners’ sugar Natural pink food coloring For the Cake Adornments Fresh red raspberries and/or strawberries, optional Special Equipment Three 8-inch by 1½- to 2-inch round cake pans Four wire cooling racks, with the fourth being used to flip cake layers right side up Cake Preparation Arrange oven rack in lower third of oven and preheat oven to 350ºF. Grease three 8-inch round cake pans with shortening or oil. Line bottoms with parchment or wax paper circles. Grease paper linings and dust lined pans with flour, tapping out the excess. Set aside. Using an electric stand mixer fitted with paddle attachment, mix self-rising flour and suga on low speed (stir) until well combined and aerated, about 1 minute. Add butter, shortening and oil and mix on slow speed until thoroughly combined. Mixture will be very thick. In a 2-cup glass liquid measuring cup, whisk together buttermilk, egg whites and extracts using a fork until well blended. Slowly add half of the liquid mixture to the batter and mix on low speed. Increase mixer speed to medium and beat until thoroughly combined, scraping down the sides of bowl as necessary with rubber spatula, about 2 minutes. Add remaining liquid mixture and beat just until smooth and thoroughly combined, again scraping down the sides of bowl as necessary, about 1 minute. Using rubber spatula, scrape and pour batter into prepared pans dividing evenly (a little over 2 cups of batter per cake pan). Smooth tops evenly with rubber spatula and then rap each pan on counter surface 2 to 3 times to expel any air bubbles. This step will create a nice level cake.Bake in preheated oven until a toothpick inserted into center comes out clean, about 25 to 30 minutes. (I have found that 28 minutes is perfect.) Cool cakes in pans on wire racks for 10 minutes. Run thin metal spatula around edges of each cake to loosen, then invert onto wire rack and peel away parchment or wax paper. Turn right side up onto wire racks (using an additional rack to flip) and cool completely or wrap while still warm to retain moisture. Wrap each cake layer tightly in plastic food wrap and keep at room temperature until ready to fill and frost. To frost and fill cake, use a scant ¾ cup frosting between each layer and then proceed to frost the cake as desired with remaining buttercream. Icing Preparation Using an electric stand mixer fitted with paddle attachment, or handheld mixer and large bowl, beat butter on medium speed until creamy. Add mascarpone cheese, Strawberry-Raspberry Sauce and vanilla, if desired; beat until fully incorporated. Gradually increase mixer speed to high and continue beating until light and fluffy, scraping down the sides of bowl as necessary with rubber spatula. Gradually add confectioners’ sugar, beating on low speed (stir), until well combined. Beat on high speed until well combined and smooth while scraping down sides of bowl as necessary, about 2 minutes. 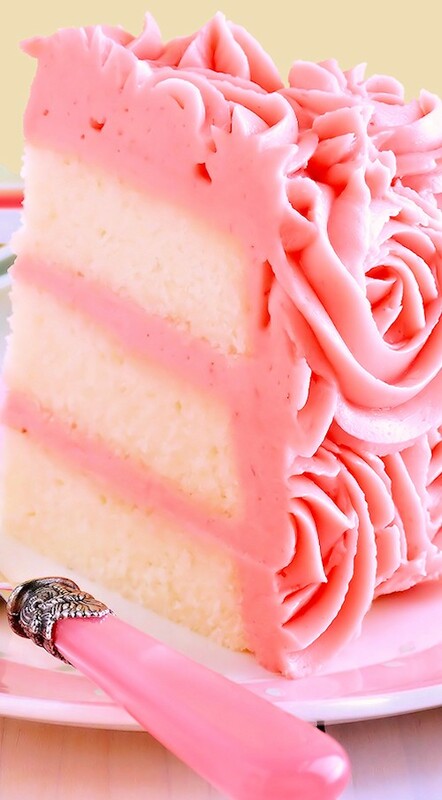 If desired, tint buttercream with pink food coloring. Strawberry-Raspberry Sauce Ingredients 8 ounces (227 grams) hulled fresh strawberries, about 1½ cups quartered 8 ounces (227 grams) fresh red raspberries, about 1½ generous cups ½ cup (100 grams) organic granulated cane sugar 1 teaspoon (5 ml) freshly squeezed lemon juice Preparation Sort, rinse and dry berries before measuring and using in recipe. Using a food processor, purée the berries. Press berry purée through a fine mesh sieve into medium saucepan; discard the seeds. Stir in sugar and lemon juice. Bring fruit pulp and juices to a boil over medium-high heat. Reduce heat to medium and cook, stirring frequently, for 5 minutes while skimming foam from sides of saucepan using a slotted spoon. Once the foam has been skimmed, reduce heat to medium-low and continue to cook stirring frequently until bright in color, thickened and reduced by half, about 10 minutes. When done, there should be ¾ cup of sauce or about 225 grams. Set sauce aside to cool completely before using. 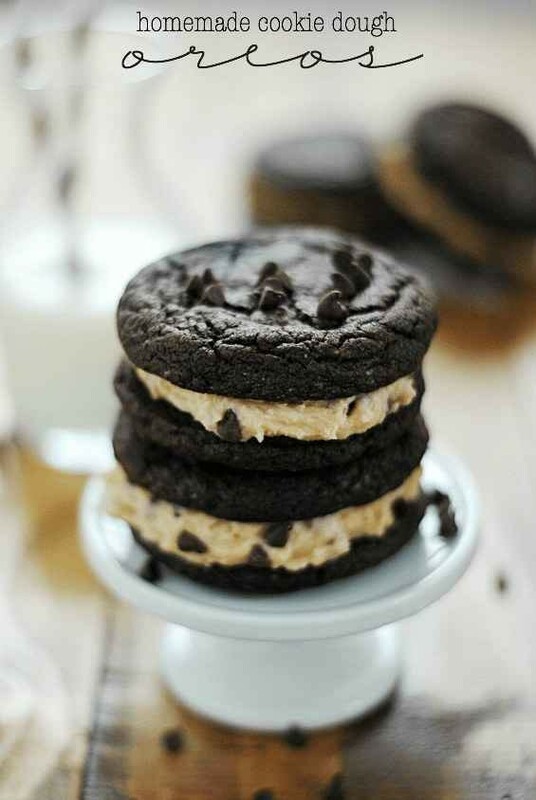 Yield: approximately 1 dozen sandwich cookies Ingredients For the chocolate cookies: 18.25 ounce Devil's Food Cake mix (not ingredients on back of box) 1/2 cup vegetable oil 2 large eggs 3 tbsp. all purpose flour 1/4 cup Hershey's Special Dark cocoa powder For the cookie dough filling: 8 oz cream cheese, softened 1/2 cup butter, softened 1/4 cup brown sugar 1/4 cup + 1 tbsp. flour 2 tsp vanilla 1/2 tsp salt 1 cup powdered sugar 1 cup mini chocolate chips Instructions For the cookies: Preheat oven to 350ºF. Line a baking sheet with parchment or a silicone baking mat. Mix all ingredients together just until dough forms. Scoop out cookie dough by heaping tablespoons onto the baking sheet. Bake for 10 minutes. Let cool for a few minutes on the baking sheet before moving to a wire rack to cool completely and fill. For the filling: Beat together the butter and cream cheese until smooth. Mix in the brown sugar and flour. Mix in the vanilla and sea salt. Mix in the powdered sugar, scraping down the sides as needed. Use a sturdy rubber spatula to mix in the mini chocolate chips. Assembly: Spread the filling on the bottom of one cookie, and top with another! Keep refrigerated until serving. I guess these people never got the memo about lasagna being a dinner food – and oh man, am I glad they didn't. These innovative kitchen wizards have turned a saucy Italian cheesefest into a gourmet dessert. This is a food trend that I have NO doubt we'll be seeing soon on upscale dessert menus around the world. It's hip, it's totally different, and it's just the right amount of weird to tickle the imagination. 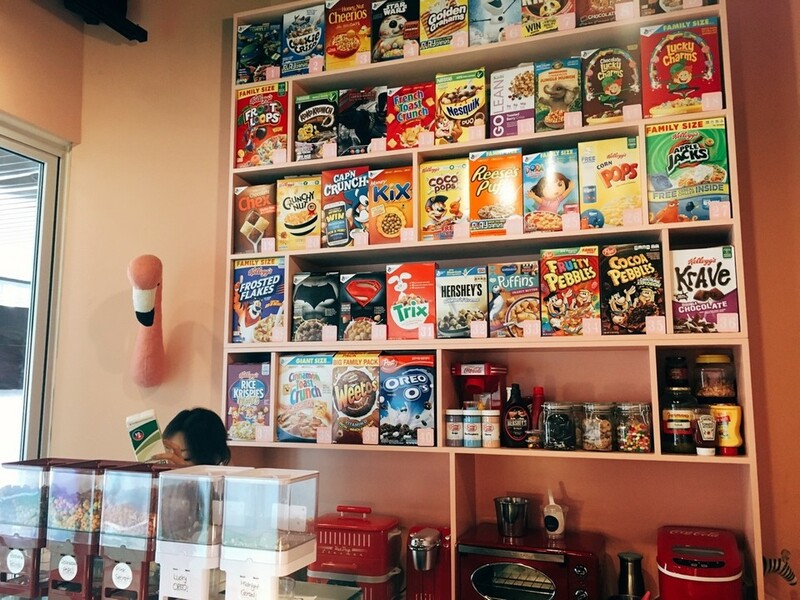 See what you think – which one of these fantastical desserts would you most like to try? (I've tried to give credit where credit is due. All the recipes are linked below; just click on the word "Recipe." Photos belong to respective owners.) 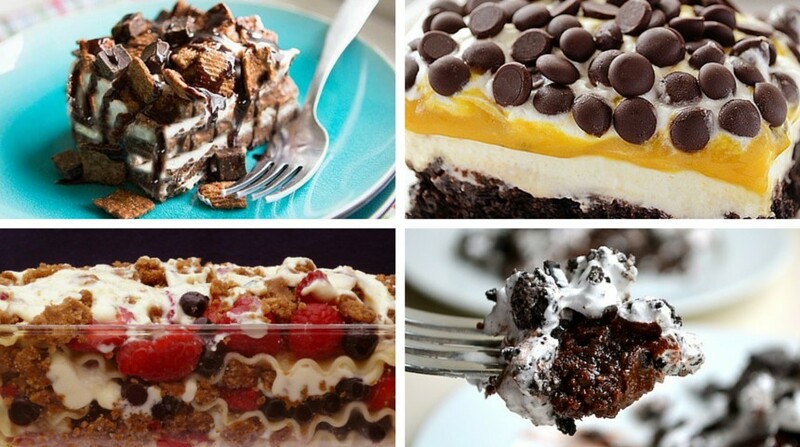 :) Chocolate Lasagna Brownies, chocolate pudding, and Oreos – oh my! Add some whipped cream, and you've got a lasagna. (I never, ever thought I would EVER say that sentence.) Recipe by Rachel Schultz, A Household Almanac Apple Pie Lasagna Let me be clear: this is not your grandmother's apple pie. Oh sure, it's got apples, cinnamon, and sugar – but it's also got caramel cream cheese filling, Heath bar toffee bites, and a touch of maple syrup. I have only one word: WANT. Recipe by Beyond Frosting Pumpkin Pie Dessert Lasagna I don't know if they necessarily needed to specify that this was a "dessert lasagna" – I think that's pretty clear from the whole "pumpkin pie" part. But I digress. We're talking pumpkin, Cool Whip, pumpkin spice chips (which exist, apparently!?) and chopped pecans. It might be 91 degrees out today, but suddenly I'm feeling a little autumnal! Recipe by The Cookie Rookie, inspired by Beyond Frosting (who is apparently our dessert lasagna MVP!) S'mores Lasagna And speaking of Beyond Frosting, she's also responsible for this dare-I-say GORGEOUS creation topped with gooey toasted marshmallows. 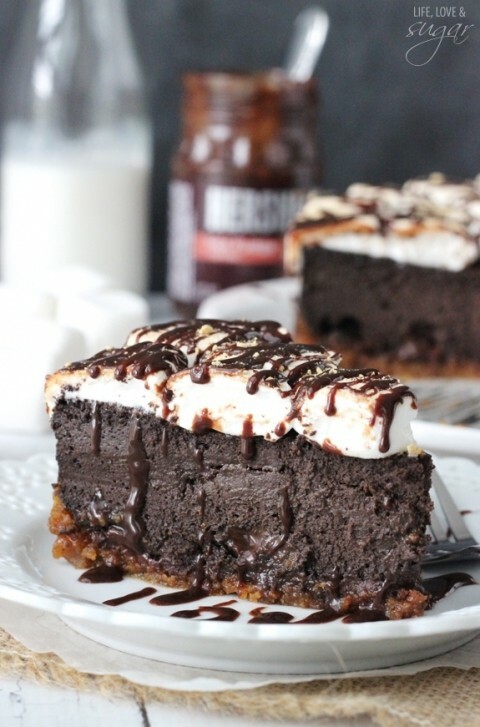 S'mores Lasagna may be an improvement on the already impossibly wonderful campfire dessert, because it's got two types of graham cracker (original AND chocolate), marshmallow fluff, whipped cream, and – for the mess-haters among us – you can eat it with a fork. Recipe by Julianne Bayer of Beyond Frosting (the dessert lasagna goddess herself. soon we'll all be wearing t-shirts with her face on it.) Brownie Brittle Strawberry Lasagna Before we get too carried away in our decadence, Julianne (yep, we're on a first name basis now) has whipped up a lighter version of dessert lasagna featuring a cheesecake filling, dark chocolate pudding, and plenty of strawberries. See? 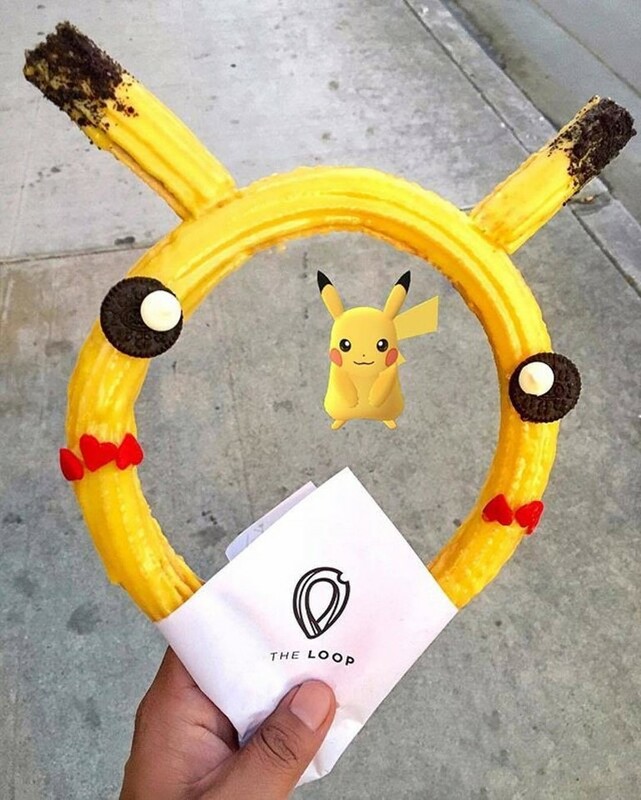 It's got fruit! It's obviously healthy. Yet again, recipe by my idol, Julianne Bayer of Beyond Frosting Nutella Cheesecake Lasagna Okay, so maybe the photography skills are a little lacking on this one, but the concept is so flawless that I had to include it. Nutella and cheesecake, married into one perfect lasagna that is then dusted with brownie mix and chocolate chips. I can't really explain how much I'm salivating right now. (Sorry for that wonderful image.) Recipe by Modern Christian Homemaker Paleo Chocolate Lasagna Eating clean? Don't worry! We've still found the perfect dessert lasagna for you. Interesting ingredients in this one include coconut palm sugar, almond butter, apple cider vinegar, and shredded zucchini. I won't pretend to understand how it all works, but I will trust the author when she says it's delicious. Maybe. Recipe by Vanessa Barejas of Clean Eating with a Dirty Mind (which is an awesome name for a blog) Fabulous Fruit Lasagna Whoa, a dessert lasagna that actually uses noodles! I bet you were wondering when one of these was gonna show up. This lasagna is a delightful conglomeration of fresh berries, mascarpone and ricotta cheeses, brown sugar, nutmeg, cloves, and a pinch of chili powder. Not what I was expecting! It can also be made, the author suggests, with chocolate pasta. Recipe by F.H. Browne, posted on Just a Pinch Chocolate Toast Crunch Lasagna Did you know that Cinnamon Toast Crunch has a chocolaty cousin? Chocolate Toast Crunch adds a special, well, crunchiness to this dessert lasagna. Its creamy filling has a hint of almond flavor. Mmm. Recipe by Cheeky Kitchen, posted on Tablespoon Frozen Snickers Peanut Butter Lasagna It's been pretty hot out, so why not stick your dessert lasagna in the freezer? 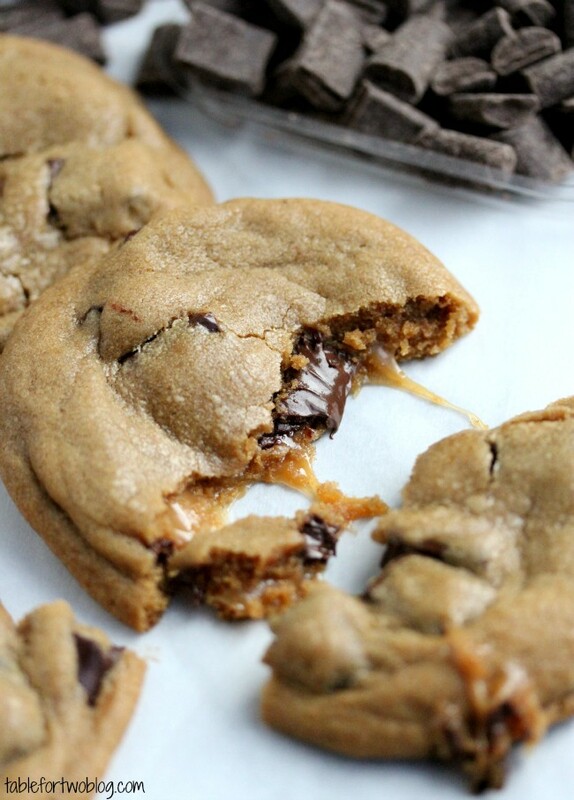 Dry roasted peanuts, caramel sauce, and little pieces of Snickers? This is exactly what I want to be eating right now. Recipe by Not Your Momma's Cookie Oreo Pumpkin Lasagna Maybe you can't get enough of dessert lasagnas. Maybe you want to try more than one of them. Why not do it at the same time? This recipe is a combination of pumpkin pie and Oreo dessert lasagnas – and I can't think of a single reason it wouldn't be delicious. Recipe by Kitchen Nostalgia Chocolate Peanut Butter Cup Lasagna But come on guys, let's be real: this is the dessert lasagna you've been waiting for. 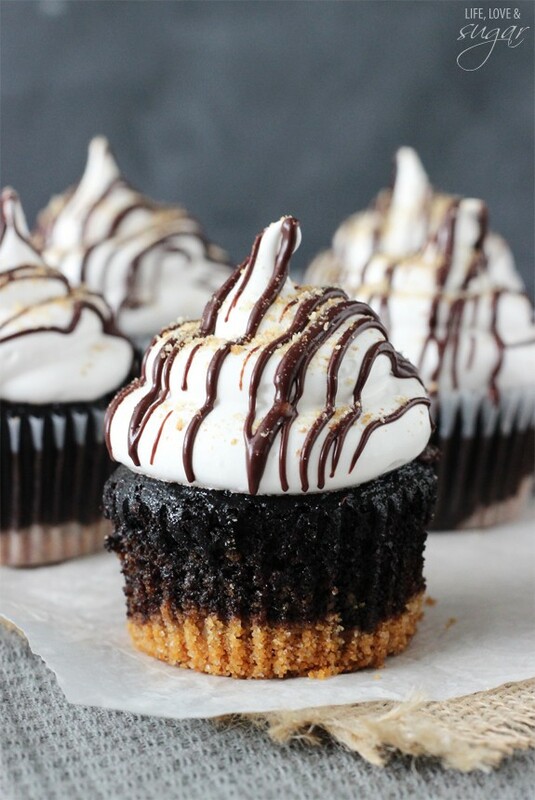 Layers of creamy and chocolatey deliciousness topped with mini Reese's cups? Game over. Recipe by Marty's Musings Chocolate Candy Lasagna This take on chocolate lasagna tops it off with yummy and colorful crushed M&Ms! And then you have your choice between caramel and hot fudge drizzle toppings. But I say, Vinglers... why not both? Recipe by Princess Pinky Girl (yes, that is her real name) Chocolate Lasagna 2.0 And finally, we've got one last spin on chocolate lasagna from Center Cut Cook. It features a thick Oreo crust, a sweet whipped cream cheese filling, chocolate pudding, and lots of tiny chocolate chips. I think the width of the crust layer and the crunchiness of the mini-chips set it apart from other versions! Recipe by Center Cut Cook Which one of these crazy creations are you trying first? For more recipes, dessert and otherwise, be sure to follow my Cooking collection :) @jlee37 @buddyesd @danidee @TerrecaRiley @LizArnone @alywoah – can you BELIEVE these?!?!? Somebody pinch me. Am I dead? I must be dead. Because I am IN HEAVEN. 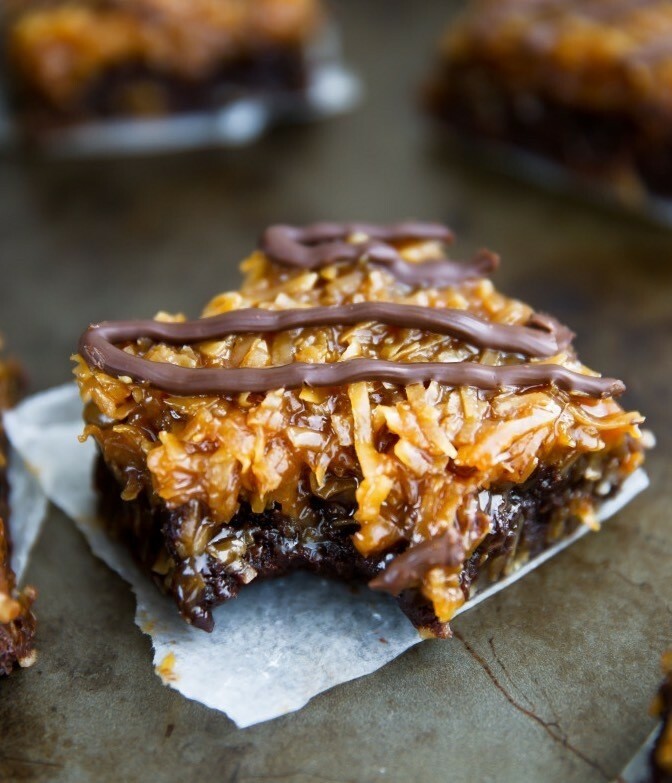 These Samoa Brownies, brought to you by Broma Bakery, are all I've ever needed in a dessert: gooey chocolate brownie, toasted coconut, and sweet caramel. I thought Samoa girl scout cookies were as good as it gets – and then I met these brownies. Samoas Brownies Recipe by Sarah Fennel at Broma Bakery Ingredients For the brownies: ¾ cup cocoa powder 1½ cups sugar 2 eggs 12 tablespoons unsalted butter ½ cup all-purpose flour 2 teaspoons vanilla extract ½ teaspoon salt ½ cup bittersweet chocolate disks 1 teaspoon brewed coffee (optional) For the coconut caramel: 1 cup granulated sugar 6 tablespoons unsalted butter, room temp, cut into tablespoons ½ cup heavy cream, room temp 2½ cups sweetened, shredded coconut For the chocolate drizzle: ¼ cup chopped bittersweet chocolate 1. Brownies: Preheat oven to 350°F. Line an 8"x8" baking dish with parchment paper and set aside. In a microwave-safe mixing bowl, melt the butter. Stir in sugar, eggs, vanilla extract, salt, and optional coffee. Once combined, fold in cocoa powder and flour. Toss in bittersweet chocolate disks. Pour the brownie batter into the baking dish, spreading evenly to the edges. Bake for 35 minutes, or until a knife inserted in the center of the brownies comes out clean. Remove from oven and allow to cool for 15 minutes before topping with caramel sauce. 2. Coconut Caramel Sauce: While the brownies are baking, make your coconut caramel. In a medium saucepan, heat the sugar on medium-high heat for about 5 minutes. Use a spatula to occasionally stir the sugar, getting to the bottom of the pan. At first the sugar will be lumpy, but will soon melt and start turning a brownish color. Don't stir too often, just enough to keep everything evenly cooking. After 5 minutes, the sugar should become fully melted. Once it becomes a dark amber hue, remove from heat immediately and stir in butter. The mixture will violently bubble. You're doing it right. Use your spatula to stir the butter and sugar until they melt together completely. This can take 1-2 minutes. Next, pour in the heavy cream and sea salt. You can use 1 to 1½ teaspoons, depending on how much saltiness you like. Use your spatula to stir until everything is combined. Place back on the stove for about 30 seconds, stirring the whole time. Remove from heat. Stir in coconut flakes. Set aside until brownies are cooled. 3.) Assemble the Brownies: Once the brownies have cooled for 15 minutes, run a knife along the edges so they don't stick to the pan. Spread the coconut caramel on top of the brownies. Again, run a knife along the edges to prevent anything from sticking to the pan. Heat the drizzling chocolate in a microwave-safe bowl in 30 second increments. Stir in between each heating. Spoon melted chocolate into a small ziplock bag, creating a makeshift pastry bag. Cut a small (tiny!) slit at the bottom corner of the bag. 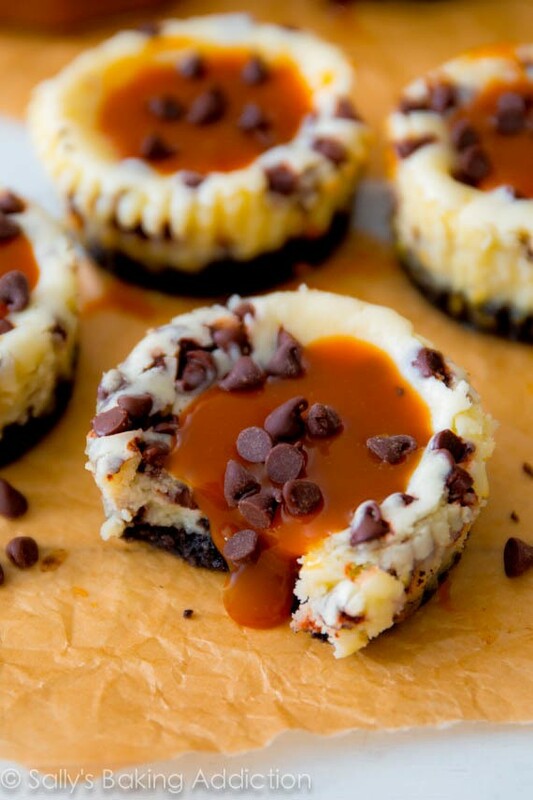 Drizzle the melted chocolate over the coconut caramel. Set in the fridge to cool for about 1 hour. Cut into 9 brownies and serve! If you liked this Girl Scout cookie remix recipe, try making your own Homemade Thin Mints! 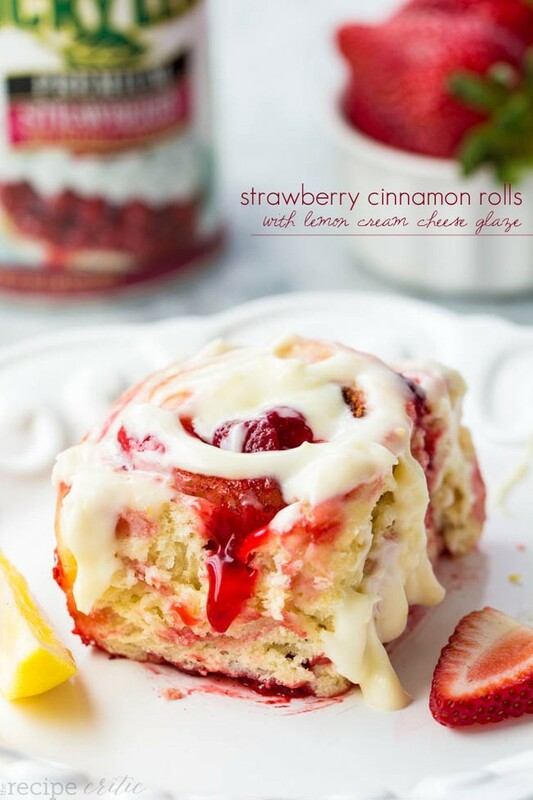 Strawberry Cinnamon Rolls with Lemon Cream Cheese Glaze AUTHOR: ALYSSA PREP TIME: 40 MINS COOK TIME: 30 MINS TOTAL TIME: 1 HOUR 10 MINS SERVES: 9-12 Delicious strawberry cinnamon rolls made with Lucky Leaf Pie filling and a quick and easy dough recipe! These will be in the oven in no time at all! INGREDIENTS Dough Ingredients:3¼ cups flour 2 tsp instant yeast ¼ cup white sugar ½ teaspoon salt 1 egg ¼ cup water ¾ cup milk ⅓ cup butter, softened Filling Ingredients: 21 ounce can Lucky Leaf Strawberry Pie Filling 2 teaspoons cinnamon ½ teaspoon sugar Lemon Cream Cheese Frosting: 4 ounce cream cheese, softened 3 Tablespoons butter, softened 1 cup powdered sugar ¼ cup half and half 2 teaspoons lemon juice 1 Tablespoon lemon zest (one lemon) 1 teaspoon vanilla INSTRUCTIONS To make the dough: In a small saucepan over medium low heat add the milk and butter. Stir until the butter has melted and remove from heat. Let stand until luke warm temperature.In a large mixing bowl whisk together 2¼ cups flour, yeast, sugar, and salt. Add to the stand mixer with dough hook attached. (You can also make this by hand, just knead until smooth once all of the ingredients are added.) Add the egg and water and mix until just starting to combine. Slowly add in the milk mixture and 1 cup of flour until the dough starts to form and become smooth. Let the dough rest for 10 minutes.On a lightly floured surface, roll the dough into a large 9x15 square. About ¼-1/2 inch thick. Spread strawberry pie filling evenly on top of the dough. In a small bowl combine the cinnamon and sugar and sprinkle on top of the strawberry filling. Roll up the 15 inch side into a log and pinch the seams. Cut into 9-12 slices depending on how thick you want your cinnamon rolls. Place in a greased 9x13 inch pan and cover with a damp cloth and let rise for 30 minutes.Preheat oven to 375 degrees. Bake for 30 minutes or until just golden brown on the tops.To make the glaze: Beat together the cream cheese, butter, and powdered sugar until smooth. Add the half and half, vanilla, lemon juice and lemon zest until combined. Frost over warm cinnamon rolls and enjoy! 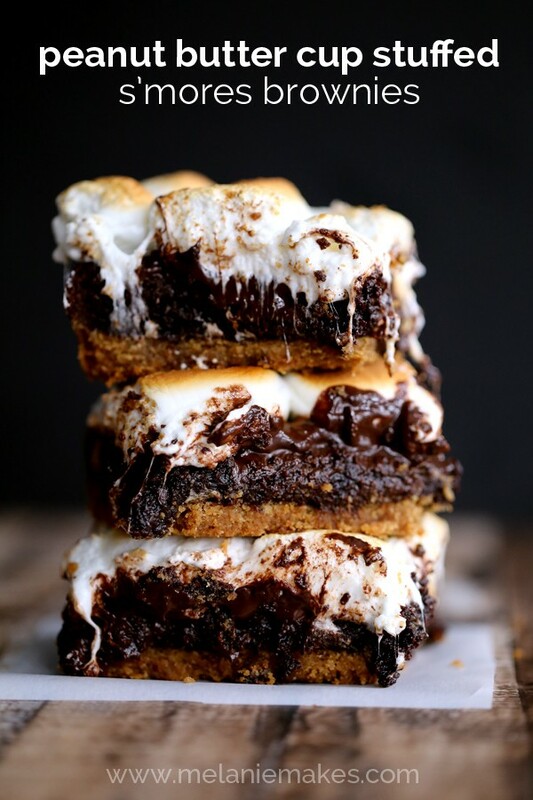 When it comes to the campfire roasted, ooey-gooey perfection that is s'mores, I'm a purist. I've never once considered putting anything but two rectangles of good ol' Hershey milk chocolate between marshmallow and graham cracker. 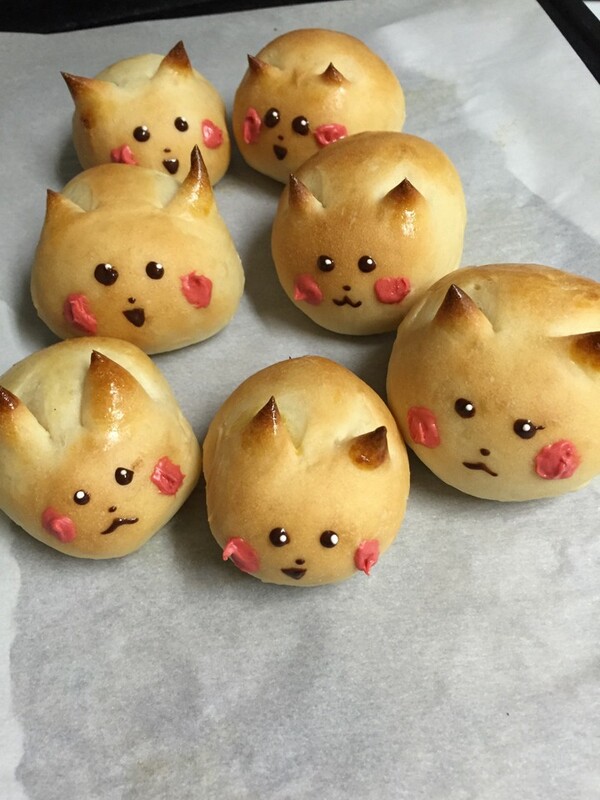 But then I found this recipe at Melanie Makes, and I don't care what you say, about blasphemy or anything else – once you've seen this picture, there's no going back. I HAVE to try putting a peanut butter cup on a s'more. It's a physical need. And if I don't do it soon, I might explode. So somebody come over and make these brownies with me tonight, please – it's an emergency. Peanut Butter Cup Stuffed S'mores Brownies Prep Time: 20 min. Cook Time: 45 min. Difficulty: Easy. Makes one 9"x13" pan of brownies. Recipe by Melanie Bauer of Melanie Makes Ingredients For the Graham Cracker Crust: 3 cups graham cracker crumbs ¼ cup sugar ¼ teaspoon salt ¾ cup butter, melted For the Brownies: ¾ cup cocoa ¾ cup butter, melted 2 Tablespoons hot water 1 2/3 cup sugar 2 eggs, beaten 2 teaspoons vanilla 1 1/3 cup flour ½ teaspoon baking powder ¼ teaspoon salt 12 peanut butter cups 1 dark chocolate candy bar 24 jet-puffed marshmallows Directions 1. First, make the Graham Cracker Crust: Preheat oven to 350 degrees. Grease a 9x13 pan and set aside. In a medium bowl, stir together graham cracker crumbs, sugar, salt and butter until combined. Pour into prepared pan and press into an even layer. Bake for 12-14 minutes or until set and beginning to brown. 2. Now, make the Brownie batter: In a large bowl, stir together cocoa, melted butter and hot water. Add sugar, eggs and vanilla and stir until well combined. Stir in flour, baking powder and salt until just combined. 3. Add the PB Cups and Chocolate: Top graham cracker crust with brownie mixture, spreading in an even layer. Press peanut butter cups into brownie batter in three rows of four. Break the candy bar into individual pips or pieces and place in horizontal and vertical rows between peanut butter cups. 4. Bake, broil, and enjoy! Bake for 18-20 minutes or until just set. Remove brownies from oven and turn oven to broil setting. Add marshmallows to top of brownies pressing lightly to adhere them to the warm brownies. Broil for 2-3 minutes or until they reach desired char level. Let brownies cool completely before attempting to cut and serve. Does it really matter what goes in the bowl? Hardly. But a massive chocolate sundae would be pretty nice. It is summer after all. This is an easy tutorial on how to make edible chocolate bowls like what you see here. 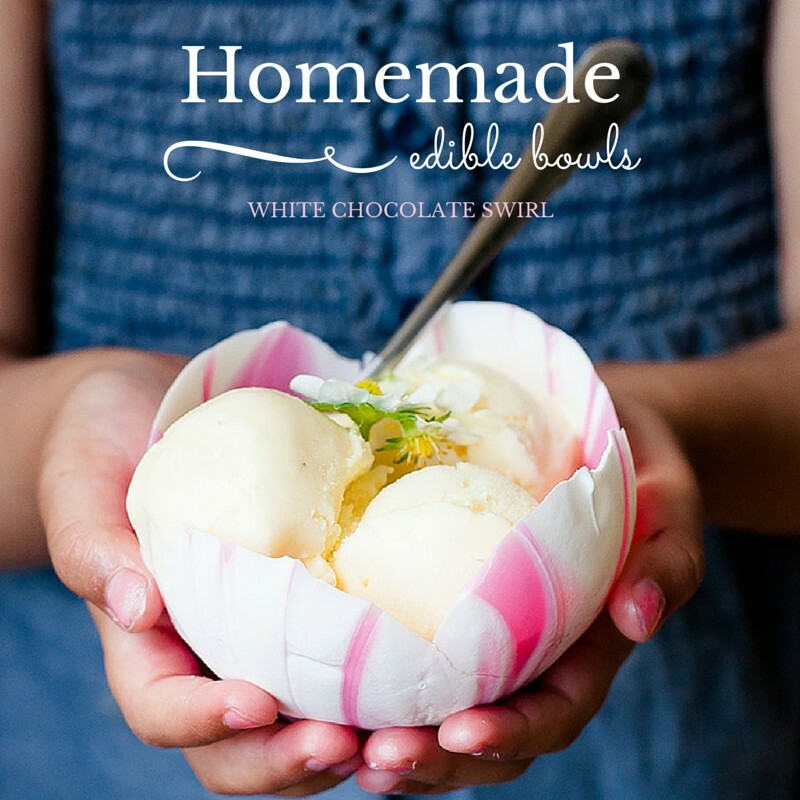 If you're using white chocolate, you can add some color to create petal-like bowls. How cute! You will need: 12 ounces (1 bag) white candy melts 6 ounces (1/2 bag) pink or other color candy melts 12 small balloons (water balloons work great) 1 toothpick Non-stick mat or parchment paper 2 microwave-safe mixing bowls 2 rubber spatulas Safety pin 1. Blow up the small balloons--not the large ones. No need for helium. In two separate bowls, melt the candy melts according to the manufacturer's instructions in the microwave. If the melted mixtures are too thick, you can add a teaspoon of oil and stir into them. To create petals, add a few drops of the pink (or any other candy melt color) and swirl with a tooth pick. Gently dip the balloon in the candy melt. Place the dipped balloons onto parchment paper or silicone sheet to set up, which may take a couple hours. Feel free to chill in the fridge to speed this up. Pop the balloons with a safety pin and carefully pull out the balloon from the chocolate bowl. Then fill it with all sorts of ice cream madness and syrup! DELISH! For more kitchen tutorials, click here. Everything except the wrapper and the box is edible. That means, what you see, you can eat! Let's not argue about colors. I happen to like the dusty orchid color scheme happening here. It's the FABERGÉ attention-to-detail design that is giving me life and a healthy appetite for cake and sugar! 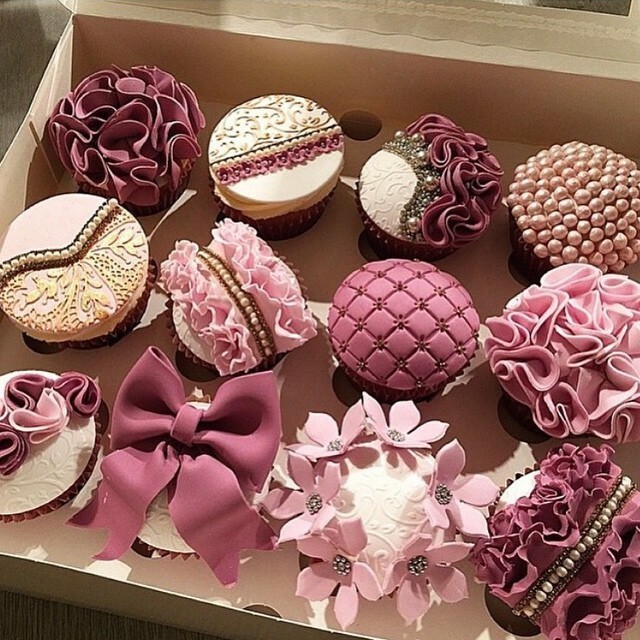 I see ruffles, bows, fowers, quilded fondant, pearls, beads and jewels. All of which would look gorgeous on a French-themed wedding sweet table. Speaking of which, are you going to be doing a sweet table at your wedding? I've got some ideas on how you can make it the best sweet table ever. 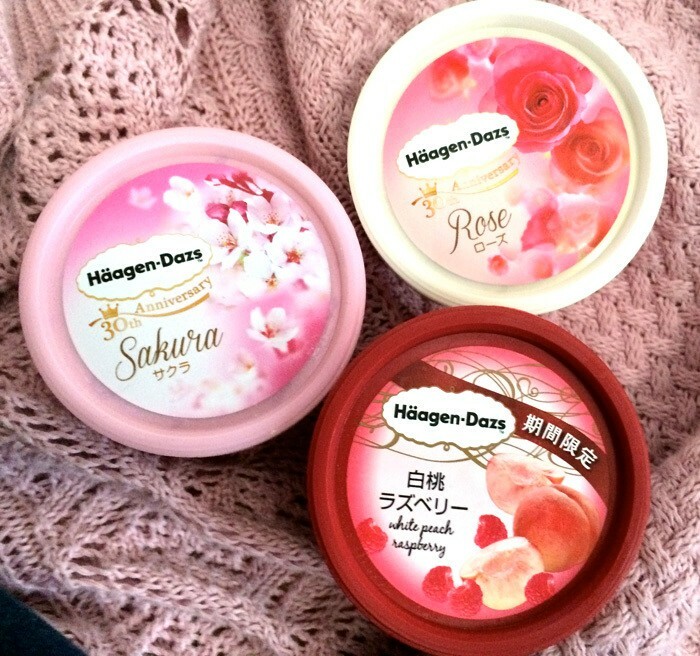 I'd love to share.